I am still trying to go through all the polishes in my stash that I have yet to try. When looking at my racks, I was totally bewildered that I didn’t try all of my Hunger Games polishes. I was obsessed with that collection, mostly because it was affiliated with the movie rather than love for the colors. But this was the color that I wanted the most, and I couldn’t believe that I hadn’t worn it yet. 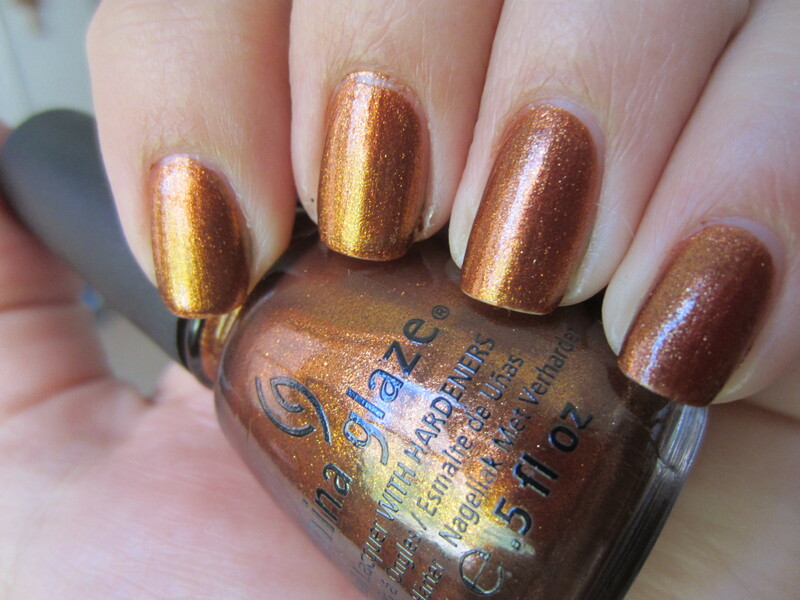 China Glaze “Harvest Moon” is a brown-copper foil. This color is like having a melted penny on your fingers. The formula was the perfect foil consistency, not to thin and not to thick. The color spread out very nicely across the nail and was completely opaque in two coats. Honestly, it applied like a dream and I have no complaints. 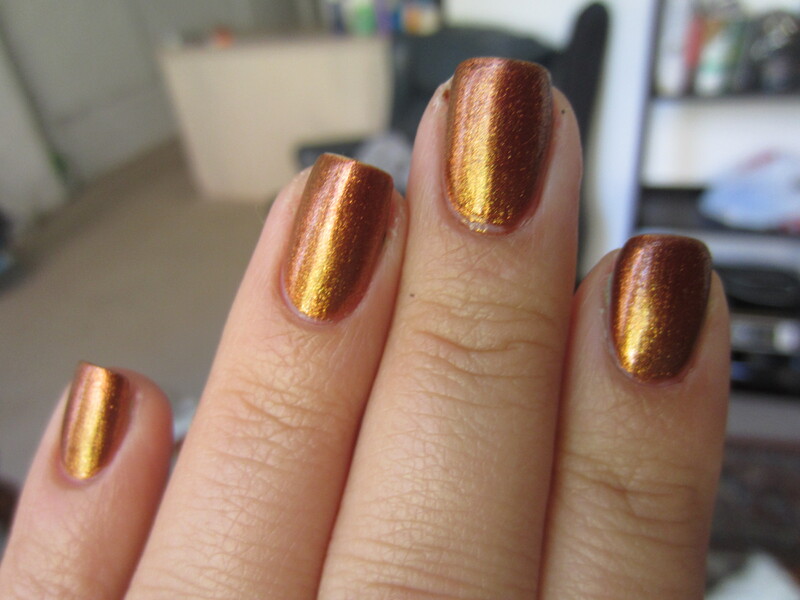 But what shocked me the most, was how this polish showed up in my pictures. In my pictures, this polish shows up as such a strong duochrome. On the nails, in the bottle, and in every picture I took you can see the shift between a perfect copper-penny color to a yellow-gold type color. I couldn’t figure out where that came from because in real life and in every other picture I saw online, that duochrome isn’t there. Honestly, I wish that duochrome was there in person because it is beyond gorgeous in the pictures. I really thought I would love this color more than I do. Maybe it is a case of being in the wrong season, because right now I’m loving “summer” colors. This color screams “fall” to me and maybe I’ll fall in love then. But right now, it didn’t grab me. It is a gorgeous color and the application was perfect. I really wish it really was that strong of a duochrome though! Have any of you guys tried this polish? Did any of you see a heavy duochrome like the pictures show? Or is this a regular polish like it seems in person and my camera is playing tricks with this polish? I did a post on it awhile ago, and I just looked back it does come as more of a duochrome than in real life! Its so weird. I love this polish though! One of my friends used my nail polish and she used the orange in this collection over this color, and it looks SO cool! I have this polish, and it definitely appears like more of a duochrome in your photos than it does on the nail. I, however, love the color regardless! It’s definitely more of a “fall” shade, though.